For everything that’s intangible about being a star, there are some useful tools we can use to measure whether someone actually is one. Is this person the only one you can imagine in a particular part? And can this person turn a bad, stupid, or generic movie into a hit? This is just a way of wondering — once more — whether Ryan Reynolds will ever be the sort of actor who can lure audiences to something like Self/less while diverting your thoughts from the dozen or so other men and women who could have carried the same body-swap movie. The plot is almost two hours of empty calories built around Reynolds, who runs around the middle of the country trying to solve an absurd mystery set into motion when a gravely ill, bizarrely accented Manhattan real estate magnate named Damian Hale (Ben Kingsley) spends some of his fortune to move his soul into Reynolds’s younger, haler body. Meanwhile, Damian’s cadaver will be returned for a funeral — presumably so his management team and CNBC can pay lugubrious tribute. The company (called Phoenix, because all the subtle names were taken) conducting the transfer assures old Damian that this new vessel was lab-raised. And given the fatlessness on display, you just go with it. (Albright, the young, clammy-looking British scientist in charge at Phoenix, is played by Matthew Goode, who, in a suit and glasses, seems like he’s starring in a different, fake chiller: Wes Craven’s Princeton.) You look at the two fit bodies lying prone on the parallel retractable beds of the soul-transfer machine and notice that the new body doesn’t look that new. Once Reynolds’s version of Damian is up and about and given a new life and name (Edward), we discover that new Damian is about 35 and graying. We never see the older man participate in the process of engineering a second body. But the minor kick of the movie is that there wasn’t one. Before Edward gets to the bottom of why, it’s all fun. He’s set up in a New Orleans manse on the border of Faubourg Marigny and the French Quarter. A brass-and-percussion street band provides a seemingly personal soundtrack for the montage of women falling onto his bed in ecstasy. Old Damian had been sad about never connecting with his droopy adult daughter (Michelle Dockery, an actress whose point continues to elude me). She’s rejected his sense of capitalism by running a drab-looking nonprofit, which, judging from the Costco décor, hands out breakfast cereal in bulk. But, for now, never mind her: There’s basketball to play, women to seduce, and Derek Luke’s offer of friendship to accept. But something’s not right. Edward misses a dose of the red pills Phoenix gave him to cut down on side effects, which include flashbacks to a life Old Damian never lived. There’s no reason to spoil what follows except to say that even by the standards of both Alfred Hitchcock and science fiction, it’s nonsensical. Edward goes to Missouri, where an idyllic sci-fi/fantasy Hollywood farmscape awaits, along with its owner, Maddy, a very confused single mother played with tearful intensity by Natalie Martinez (who, unfortunately, spends the movie relegated, in function and attire, to “nanny,” even though the child she’s looking after belongs to her character). The script is credited to the Spanish brothers Àlex and David Pastor, and the director is Tarsem Singh, working a more flavorless angle than he’s probably used to. Gone is the nutso visual maximalism of The Cell and Immortals and the layered self-amusement of Julia Roberts in Mirror Mirror. 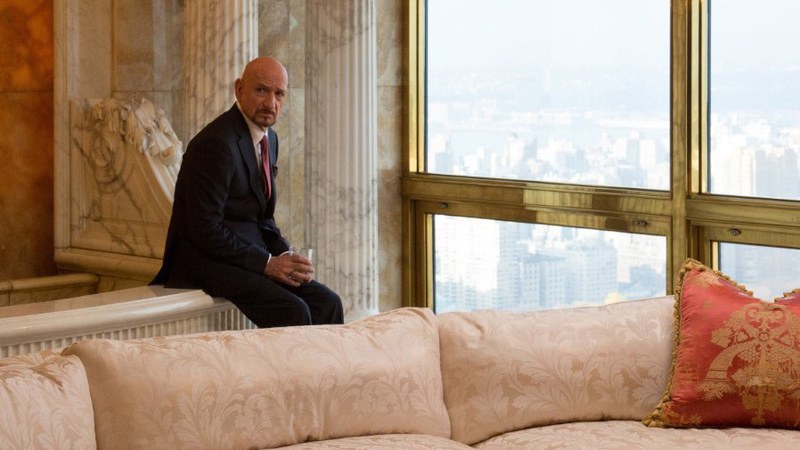 The closest to baroque that things get here is Old Damian’s gilded apartment, with its Trump’s-eye views of Central Park. It’s as if a 24-karat dog pooped on all the surfaces. Singh is in charge of a safer, more conventional movie, where “We’re looking for an abandoned warehouse” is an actual line of dialogue. I think the scientific ideas that Ex Machina expressed are embedded in sexual clichés, but there are, at least, ideas to dismiss. For most of Self/less, I was sure I was watching the first two episodes of a vapid new cable series. A late twist kicks the film into a moderately higher gear of wit, but I spent the whole thing feeling bad for Reynolds, who works hard to sell the movie as something other than a composite of everything from Jacob’s Ladder and The Fugitive to the Bourne series and Limitless. He’s giving you most of what he’s got. You just never sense that you couldn’t have gotten the same performance from about eight other men, which, I imagine, is how the role wound up with him. With these action movies and romantic comedies, that often feels true of Reynolds: Somebody else said no first. What’s fascinating is that he’s peaking as a performer. He has lost the glibness and sarcasm that made his physique more of an asset than it probably should have been. In the spring, he reached a new, casually soulful place as Helen Mirren’s reluctant attorney in Woman in Gold. Before that, his emotional suppression was the best thing in Atom Egoyan’s truly embarrassing The Captive. And he’s just as good as a seemingly wholesome gambler in Mississippi Grind, a casino drama with Ben Mendelsohn that comes out later this year. Reynolds can’t do gonzo the way Jake Gyllenhaal thinks he can, and Bradley Cooper is now much smoother and more confident in any part he gets. He might never get roles that are going to the Christian Bales and Leonardo DiCaprios of the world. He might actually be better as a second banana, the way he is with Mirren and Mendelsohn. In the meantime, he can drag slick-enough action movies like this new one over the finish line. But hopefully Reynolds has, at least, forgotten the title. It’s not less self he needs, but more. Another month, another ultimately inadequate found-footage horror movie — and from the Blumhouse cannery, too. But The Gallows has a cleverness that bobs, occasionally, above the surface of cesspool murk. You can’t tell whether it’s just flotsam or a corpse, but for most of the 80-minute run time it almost doesn’t matter. It’s at least something. The setting is a Nebraska high school production of a play (The Gallows) that, according to camcorder footage from 1993, appears to be some kind of puritanical trial drama whose climax is the lynching of the male lead. You can hear the parents of that actor expressing expository marvel at how good he is. But then he steps onto the scaffold and is hanged for real. Decades later, the school is restaging the play, presumably to complete business that went unfinished. The footage here, this time made public by the local police department, mostly belongs to the smartphone of a bullying football player named Ryan (Ryan Shoos) who decides to recruit the star of the show and his former teammate, Reese (Reese Mishler), to destroy the set because theater is for pussies. Ryan’s feisty cheerleader girlfriend, Cassidy (Cassidy Gifford, daughter of Kathie Lee and Frank), invites herself along and, eventually, the play’s earnest female lead, Pfeifer (Pfeifer Brown), turns up, too. They’re all bait for whatever is trying to slip that rope around their necks. The Gallows betters its predecessors by adding a metaphysical presence that conforms to the bogeymen of old — here it’s somebody in a leather hood, waving a noose. With any of these movies, the question for me is always how people manage to hold on to cameras when they’re running, crawling, or crying for their life. It’s a formal crutch that never quite breaks through illogic to get to something like “societal metaphor.” It just makes the filmmakers — Travis Cluff and Chris Lofing, who wrote and coproduced too — and the credited director of photography (Edd Lukas) seem desperate. It’s also impossible to keep track of the jumps in footage, when, say, someone’s battery dies. The video leaps, fitfully, from device to device like a disease in search of a host. And has the police department also performed sleight-of-hand edits and provided the footage its banging, whirring, slamming, wholly insinuating sound design? There’s also the loaded hassle of watching a movie have fun with a symbol of racial threat. The noose persists on campuses and outside homes and churches to terrorize and intimidate. The near-comprehensive whiteness of these Blumhouse movies — the most recent widget was the partially fascinating Skype-mare slasher film Unfriended, from the spring — poses no problem from film to film. But here you do wonder how a change in the casting strategy might have also altered the nature of the threat. What would adding a black character to this movie in particular have done to reshape the meaning of the bogeyman? The lack of any credible explanation of why what’s happening is happening fertilizes an inclination to speculate. No one in the racially mixed audience I saw this with the other night seemed to be doing much speculation. They just went with it — well, as far as something this violently incoherent could take them. There was jumping, shrieking, and shouting advice at the screen. This is a movie made for the “don’t go in there”–minded. People want the visceral punch not of good horror, per se, but of any horror. But sometimes with these footage films, the bridge to get to horror is laughably rickety. At some point in The Gallows, the characters stumble upon a warping video that reexplains the events of 1993, complete with spliced-in news coverage. Found footage is one thing. But you’re in trouble when the footage has to find you. In theory, The Gallows was shot with phones. But Sean Baker’s gangbusters farce, Tangerine, actually was — with an iPhone. And that is the least of its many vertiginous selling points. ​In part, it’s the story of a Los Angeles transgender prostitute named Sin-Dee Rella (Kitana Kiki Rodriguez), just out of jail and on a mission to find the non-transgender white woman who slept with Sin-Dee’s man, and her best friend, Alexandra (Mya Taylor), who attempts to serve as a one-woman bomb squad. In part, it’s the story of an Armenian cab driver named Razmik (Karren Karagulian) cruising the streets for fares. In part, it’s the story of how they all happen to descend upon the same grubby doughnut shop one Christmas Eve night. I wrote about this movie in January from Sundance. I’ve seen it again since then and could watch it every week until Baker’s next scuzzy, acrobatic magnum opus. He has an affection for the urban underbelly and a way with personality- and reaction-based comedy that’s hard to do. The indignities, insults, and vulgarities pile up until they feel monumental. The races, ethnicities, genders, and sexualities all pinball off each other until it starts to feel almost musical. The only thing that Rodriguez and Taylor, a pair of amateurs, don’t do is burst entirely into song, and they could. They’re stars — to themselves and therefore to us. By the film’s shockingly poignant final sequence, they’ve also become actresses. There’s a bit of Scorsese’s After Hours here, at least in some of its surrealism, though Baker’s doing more celebrating than he is ironizing and decrying — but not in a fashion-photographer, party-planning-anthropologist sort of way. The film never loses sight of the risks and dangers and general ugliness of its colliding worlds. One bonkers motel sequence has a fundamental sadness that can’t be upstaged by comedy. That the tone shifts there without costing Baker the movie indicates how soundly we’re in the hands of a confident, humane artist. He’s not fetishizing or spotlight-shining. These people are the way they are, the movie says. This obscenely vibrant patch of L.A. is officially an enclave. But Baker makes it feel bigger and louder and crazier than that. He turns subculture into family.